*Your Choice! * Either A 5 Month Assignment Lease Or A New 1 Year Lease Commencing Jan 1/18! *The Heathview By Morguard! *Outstanding Complex+Rec Facilities! 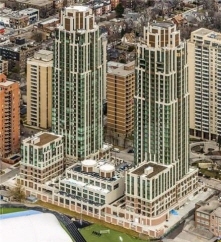 *Condo Style Living In The Heart Of Forest Hill Village Just Mins To Subway,Ttc,Shopping,Rest+All Amen! *Spectacular 1+1Br 1Bth East Facing Ste W/Hi Ceilings! *Abundance Of Floor To Ceiling Windows+Light W/Panoramic Views! *Fab Flow For Entertaining! *Approx 781' Of Luxury! *Move Right In+Enjoy Jan 1/18!